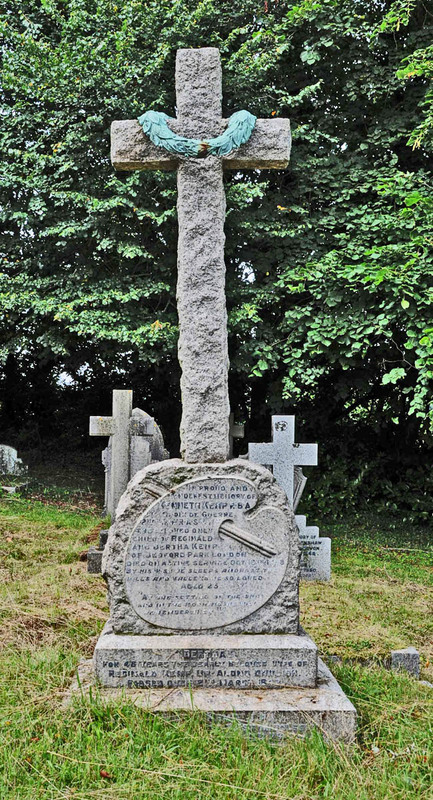 Memorial: Dawlish Memorial Inscription KEMP K. 2ND LIEUT. (C. De G.) R.A.S.C. Kenneth Reginald Flint Kemp enlisted on 2 March 1916 but was not called up for service until 4 June 1917, and it was in the interval that he was in Flanders. He was initially made a Private service no. M/ 334502 in the Army Service Corps (M.T.). This followed a medical examination on 20th March 1917 as a result of which he was marked down as “fit for transport but not for infantry”. His own declaration on April 2nd 1917 stated that he was “unable to march long distances and carry heavy weights” and that he had a “weak back”. The medical diagnosis was of scoliosis. On 4th October 1916 Kenneth Kemp went to work in Flanders with Dr Munro’s Field Ambulance Corps. He had enlisted on 2 March 1916 but was not called up for service until 4 June 1917. 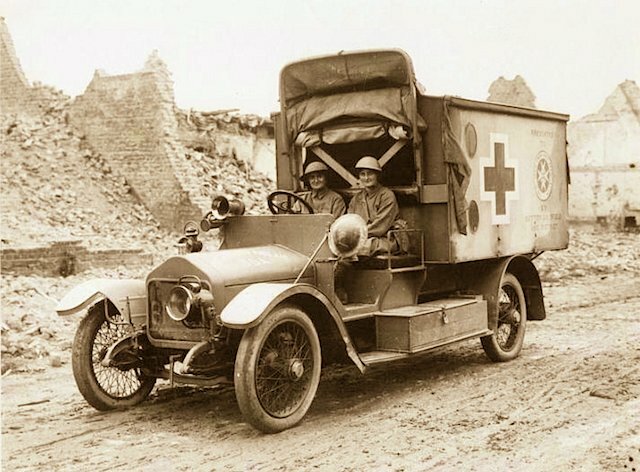 Dr Hector Munro set up a ‘Flying Ambulance Corps’ to help the Belgians who had been caught badly unawares by the German attack of August 1914. Dr. Munro advertised for “adventurous young women to equip an ambulance unit for service in Belgium,” and of the 200 applications he received, he accepted four: Lady Dorothie Feilding, Mairi Chisholm, Mrs. Elsie Knocker, and Helen Gleason. Kenneth Kemp later put his ill health down to strains involved in driving ambulances and carrying wounded on stretchers. During this time he was awarded the Croix de Guerre, possibly by the Belgians but more likely by the French whose naval brigade of Marins were supported by the ambulances based at Furnes. He had been seen by a Medical Board on 15th April 1917 and been found “Unfit permanently for General Service” and fit for Light Duty at Home. Kenneth Kemp applied for a Commission which he was entitled to do as a member of Westminster School Officer Training Corps. 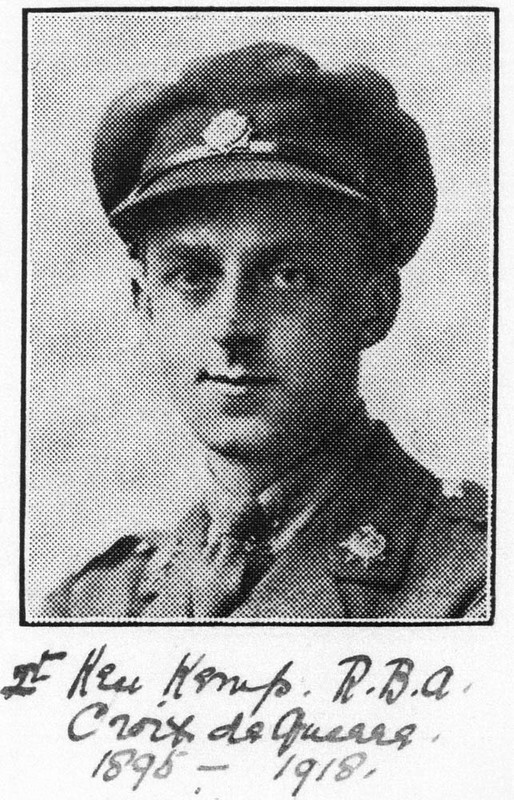 He was discharged as a Private on 12th August 1917 and appointed 2nd Lieutenant on the following day. After a further Medical Board on 12th January 1918 he was then reviewed by a Medical Board Report on a Disabled Officer, on 6th March 1918. His disability was put down to 10 months as a field ambulance driver. A further report on 6th June showed him to be nervy and tremulous and suffering headaches. On 10th September it remarked that his sleep was more satisfactory and headaches less frequent. In all of this time he had been attached to the Home Mechanical Transport Depot at Holborn. He was taken sick and placed on the Sick List on 7th October 1918 and died at home from double pneumonia on 18th October. Kenneth Reginald Flint Kemp was the only child of Thomas Reginald and Bertha Kemp (nee Flint). Thomas Reginald Kemp dropped his first Christian name in later census entries and appears as Reginald Kemp. Kenneth was born into a family with legal skills. Thomas Reginald Kemp (1866-1943) was the son of Thomas Richardson Kemp (1835-1905) who was born in Holloway, London and was a barrister in practice. His wife was Emily Jane Catherine Elizabeth Comer Plumptre (1845-1925) from Notting Hill. Thomas Reginald Kemp was baptised on July 4, 1866 at St Mark’s, St Marlebone, London. He went to Westminster School and qualified in law, and in 1891 was staying at 11 Westcliff, Dawlish with his great uncle, Charles Wade, a barrister at law. This may have been one of a number of visits to Dawlish which led to his eventual choice at retirement. He married Bertha Flint (1864-1942) in Uttoxeter, Staffordshire in the first quarter of 1894. Bertha Flint was baptised on 4 September 1864 and was the daughter of Abraham Augustus Flint (1821-1897) and Anne, nee Keates (1821- ). Abraham had been born in Uttoxeter and was, in 1891, a solicitor and Coroner for Staffordshire. Bertha was educated at Queen’s College, Islington, London. Reginald and Bertha Kemp set up home at 37 The Avenue, Bedford Park, Hounslow, and Kenneth Reginald Flint Kemp was born there in April 1895 and was their only child. He was baptised on 12 May 1895 at St Michael and All Angels, Bedford Park, Hounslow. He was sent to school at Westminster School and was 15 at the time of the 1911 census when the family lived at 16 Woodstock Road, Chiswick. He was probably leaving school as the threat of war was building, and he became a painter and one example of his work is shown here. He was a member of the Royal Society of British Artists (RBA). 2nd Lieutenant Kenneth Kemp, RBA. Head of girl painted by Kenneth Kemp,RBA. “Lady Under Fire On The Western Front”, edited by Andrew and Nicola Hallam – the letters of Lady Dorothie Fielding, M.M. and Croix de Guerre.